The new range of Amenabar Series Powered Chain Hoists is the result of the company’s broad experience blended with the advanced technology built into its machines and manufacturing processes under the continuous improvement policy implemented in line with the company’s Quality Assurance System. 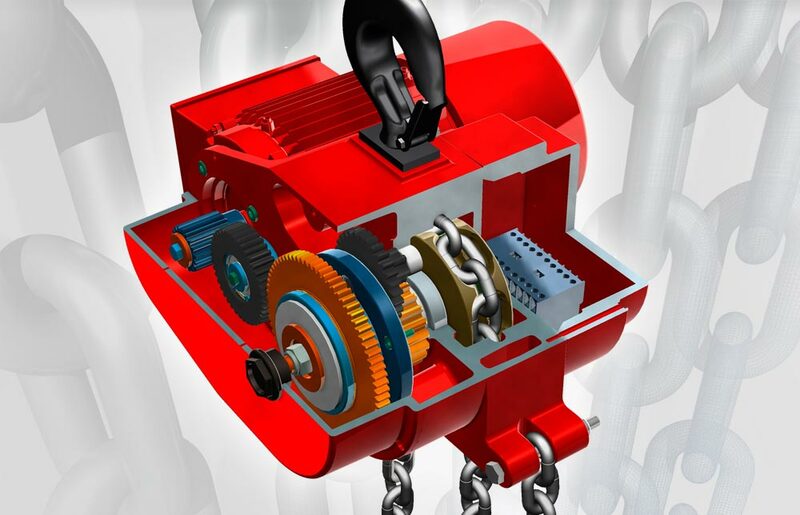 Amenabar Powered Chain Hoists are the only ones on the market with permanent load chain guide in the shape of two central bodies which completely surround the sheave, thus ensuring that the load chain is permanently guided all along its travel on the plane of rotation of the sheave. Amenabar Powered Chain Hoists have the qualities most sought- after by customers: safety, reliability and guaranteed operation at competitive prices. To judge the cost-effectiveness of powered hoists their nominal capacity and FEM Group must be known. Amenabar recommends FEM group 2m powered chain hoists, as their usefullifetime are twice as long as those in group 1Am. FEM Group 2m gives greater safety, longer life and clear savings for the customer. Maximum Safety. The load chain can not jam or break because its PERMANENT GUIDE. Maximum Reliability. Perfect operation and immediate braking action. Maximum Useful Lifetime. Built to work at fuI! Load (Heavy duty) in the harshest conditions for many years. (FEM Group 2 mi). Minimal Maintenance. We recommend simply greasing the chain. Standardised. Exceeds the requirements of European Standards. Multi-Purpose. Capable of working in horizontal, vertical and reverse positions. Load Test Certificate. Each chain hoist is tested at 125 % of its nominal load. Máxima Garantíatee. 3 YEAR basic guarantee (1 year for the chain and permanent guide). Competitive Prices. Amenabar chain hoists mean Guaranteed Cost-Effectiveness.